The House of the Seasons acquired this extremely rare zinc fountain from a dealer in Boston. “Leda and the Swan” represents some of the finest American metalwork ever produced and is known to be the only remaining J.W. Fiske “Leda and the Swan” fountain still in existence. 19th Century American J. W. Fiske was the most prominent American manufacturer of decorative cast iron and cast zinc in the second half of the nineteenth century. He designed and built the fountain in circa 1875 from zinc. Fiske’s great rival in the decorative cast iron field was J.L. Mott Iron Works, also of New York City. 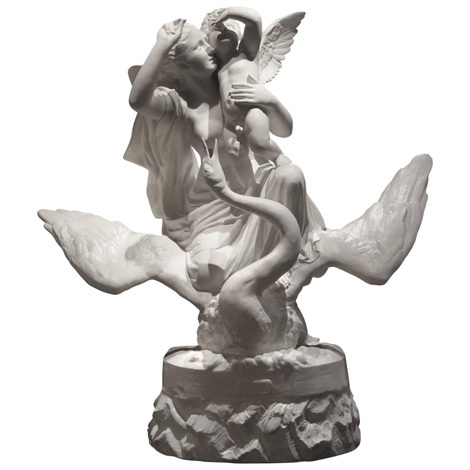 The artists stunning sculptural work depicts the Classical Greek tale of “Leda and the Swan”. Leda and her child peer into the heavens, resting gracefully upon the shoulders of Zeus, who is portrayed in the form of a Swan.